Given that my birthday falls near Valentine’s Day, I am into a layer cake for a Valentine dessert. 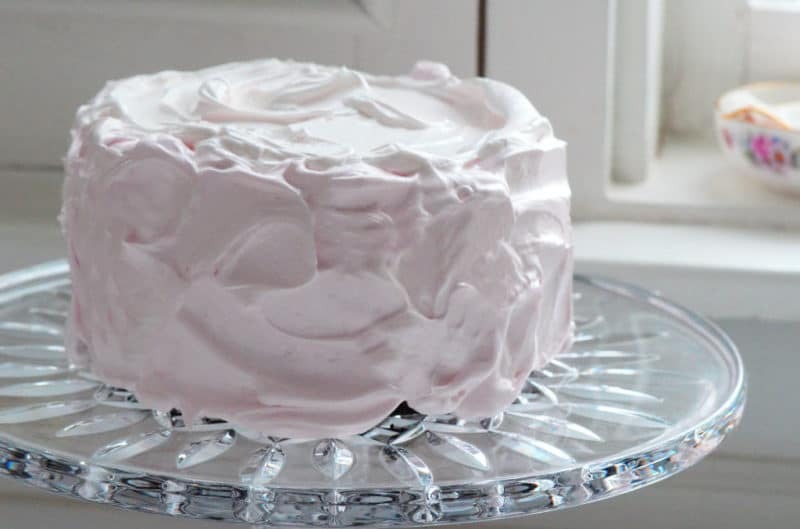 My mother baked me memorable cakes always for my birthday, with my favorite marshmallow-like frosting, ethereal and light and pink over a chocolate or angel food cake. Chocolate. The cake’s flavor is the very deep chocolate kind, made so by the addition of both cocoa and melted chocolate. If it seems like too much bother to cut up a couple of ounces of chocolate and melt with boiling water, then I can’t help you. At least promise me you’ll buy a decent chocolate cupcake somewhere. Light. This finish to dinner is light! On Valentine’s Day, and most any day, I want dessert but I want it to be on the light side so that I don’t feel the weight of the world in my tummy after dinner. There is very little fat overall here (no butter, anywhere), between the cake and the icing. A slice will satisfy without being so rich that it takes you to confession or over to the couch for a rest. I suppose it doesn’t matter all that much whether my mom made this cake for me once, twice, or every year until I was eighteen and left for college. It’s still my cake, one I’ll happily take with me and my memories as I head out to play life’s back nine. I love this recipe, adapted from the charming Miette cookbook, for its deep chocolate flavor and ultra-moist texture. Note that you can substitute the buttermilk with whole milk mixed with a squeeze of lemon and left to ferment for a few minutes before adding to the batter. 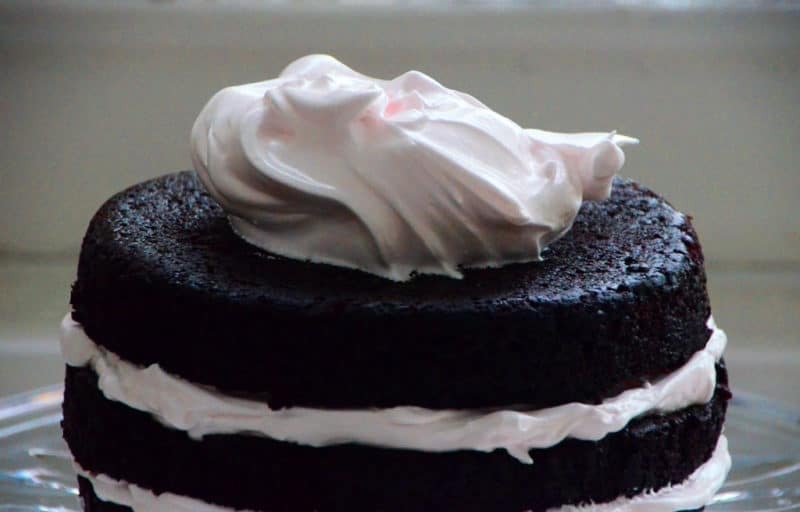 Ice the cake with the beautiful, fluffy meringue icing, or with your favorite icing. Makes 2 6-inch layer cakes using 6×3-inch pans, or about 24 cupcakes, or one 10-inch round. Preheat the oven to 350°F. Grease cake pans and dust with cocoa powder. For cupcakes, line tins with paper cupcake liners. In a medium bowl, whisk the flour, cocoa powder, baking soda, baking powder, and salt together. Pour boiling water over chocolate in a small heatproof bowl. Cool for 15 minutes, stirring until the chocolate melts. In a separate bowl, stir the buttermilk and vanilla together. Using a stand mixer fitted with the whisk attachment, whisk the eggs on high speed until light and foamy (about 2 minutes). On low speed, add the oil, then increase speed to thoroughly combine. On low speed, add the chocolate mixture into the egg mixture, beat briefly. Add the buttermilk and vanilla mixture, beat briefly. Add the sugar and beat until the batter is smooth (about 2 minutes). Remove the bowl from the stand mixer and gently fold in the dry ingredients with a rubber spatula until combined, pressing against the sides of the bowl to break down lumpy. The batter will be slightly lumpy. Pour the batter in the cake pans evenly, or in cupcake liners to ¾ full. Bake for 55-65 minutes for the cake (about 30 minutes for the cupcakes) or until the tops spring back when lightly pressed and toothpick inserted comes out clean. Cool in the cake pans until just barely warm, then run a knife around the edges to loosen. Remove cakes from pans and cool on racks completely. For layer cake, slice 6-inch cakes in thirds across using a sharp bread knife. If freezing one cake, before cutting it into layers, wrap with double layers of plastic wrap and freeze. This marshmallow-like icing is best made and eaten the same day. Don’t let the candy thermometer deter you…it’s not complicated to use, and so worth it! In the bowl of a stand mixer fitted with the whisk attachment, combine the egg whites and vanilla. Beat just until frothy, then stop. In a small heavy saucepan, combine the sugar, cream of tartar, and water and bring to a boil. Continue boiling until the sugar reaches 230 degrees on a candy thermometer. Remove from the heat immediately and pour into a heatproof bowl or measuring cup. Turn the mixer back on medium high speed, beating the egg whites. Slowly pour the sugar syrup into the whites (aim for between the whisk and the side of the bowl). Beat until the whites are very fluffy and cooled almost completely. Add small amounts of pink food coloring, if using, until you get the shade of pink you are after. Dollop generously between the layers of the cake and on top. Icing the sides of the cake is optional; the double chocolate cake is moist enough to be exposed. For cupcakes, either pipe or simply spoon onto each cake. 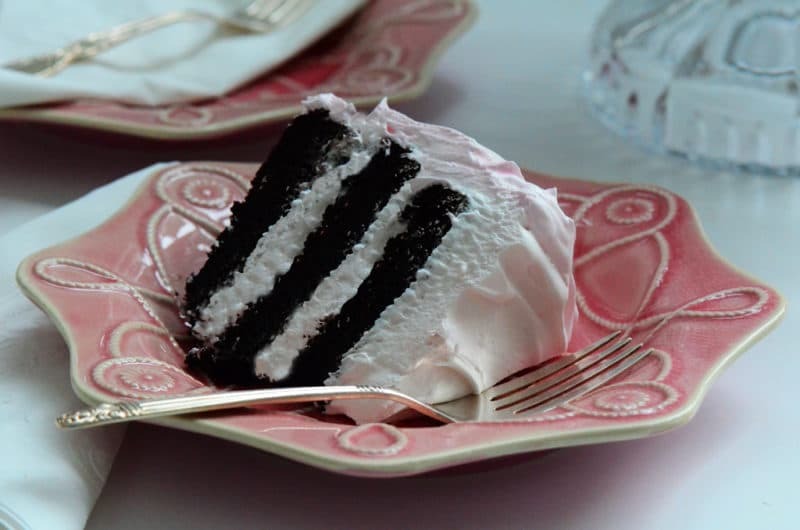 18 Responses to "Double Chocolate Cake with Fluffy Pink Icing"
wow ! beautiful and looks really delicious! mention of 7 minute frosting brings memories of the ’70s rushing back! Oh Maureen! That cake screams “Happiness”! When we were shopping. What a treat. This looks wonderful!! I’m anxious to try it!! Okay…it’s 3:25 Fri am….yup….can’t sleep so I thought I brows a little and OMG!!!! Now all I want to do is go in the kitchen and make this luscious looking cake. NOW, how will I ever get to sleep????? By the way I’ll be in Harbor this weekend to be with Shelby and family ski with the grands. Maybe run into you. Maureen, I’m feeling nostalgic. Fluffy white frosting is this family’s favorite, only my husband and kids love it on [gasp] white cake. I just made some white cupcakes with fluffy white frosting for dessert last night – an early Valentine for my husband. Can’t believe how much our lives connect even when we don’t connect in person very often. Happy birthday! is the “sugar” used in the frosting: plain sugar or icing sugar? Hello and thank you! That’s granulated (plain) sugar for the icing. I have just made this cake! It looks and smells amazing (must wait until tomorrow to eat it). I’m not sure about the icing because I don’t have a candy thermometer! Whatever the case, I’m sure it will be yummy. Chocolate cake with pink icing was my daughter’s wish for her 7th birthday, and this fit the description perfectly. Thank you! I’m so happy to know your daughter and I have the same taste in birthday cakes! Thanks for sharing! Making this cake also for my Daughters birthday. As she has asked for chocolate cake with pink frosting. She will be 5. It looks delicious. How special, Rebekah–happy birthday to your daughter, a lucky girl! Enjoy the cake and the love, right here in Michigan. I could use a little clarification on the amount of batter produced. I have two 6″ x 2″ Fat Daddio cake pans. This recipe produced a Lot of batter. I didn’t want the cake pans to overflow – so I ended up making some cupcakes with the extra batter. But… I’m confused. You write that this makes two 6″ layer cakes? Is one meant to have four cake pans in order to make two separate layer cakes? Isn’t that kind of unusual? Aren’t most recipes for one cake, not two? I just wanted to make one small cake. In the photo I only see one cake. 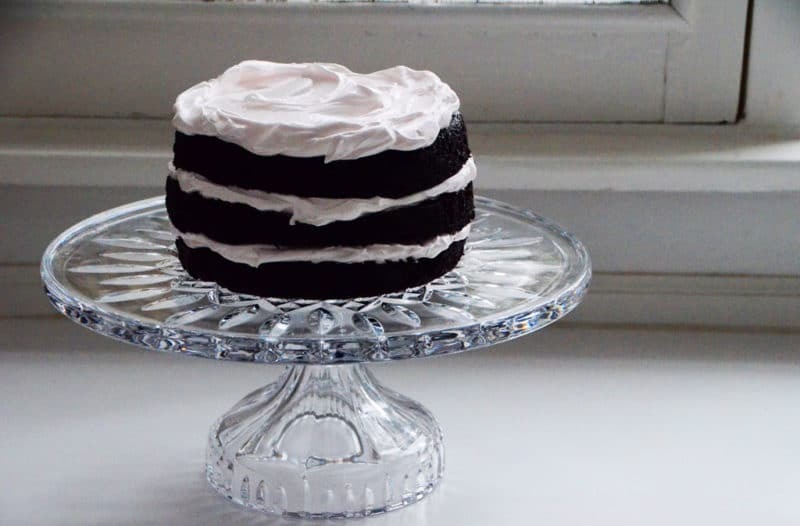 Or, did you mean two layers for one cake? Which doesn’t add up because surely the batter would have spilled over. And then you write that you cut the cakes in thirds? That is going to produce Extremely Thin layers, with my cakes – not anything like the picture I see with the recipe. Hi Jennifer–thanks for your questions and sorry for any confusion! This is adapted from Miette, which uses two 6×3-inch specialty pans and makes two cakes from this batter–see this. Each one is cut into thirds to produce the cake shown in the photos. I’m updating the post to clarify the size of the pans! Hi Maureen, I’m planning to make this cake for dessert on Christmas Eve. It makes me nervous to think about cutting a 3 inch cake into three slices of one inch each. Any tips or suggestions on how to do this without making a mess? Also, I don’t use vegetable oil other than olive and that would not work in this recipe, so I’m thinking of substituting coconut oil. Do you think that would work? Thank you for all your hard work in creating your cookbook and putting all this information on your website. My brother and I always cook a Lebanese dinner on Christmas Eve using our Grandmother’s recipes. Your recipes are so close to what we grew up with, and I love the quick and easy tips! What a time saver in this day and age. I have the Ma’moul and Baklave made, saw this recipe and thought it would be fun to add this cake! Wishing you a wonderful Holiday! Hi Marion! I’m so glad you commented. I want you to use a different recipe for this cake and frosting, okay?! It’s coming out on my blog shortly!! You can sub the coconut oil. Melt it, then cool to room temp, so that it is liquid but not warm. Make sure all the other liquid ingredients (eggs, etc.) are room temperature so they don’t solidify the coconut oil in the process. Merry Christmas to you and yours! Sounds like you’re going to have a wonderful feast!